The main goal of the Gaia mission is to make the largest, most precise three-dimensional map of our Galaxy by surveying an unprecedented one per cent of the galaxy's population of 100 billion stars. During the mapping, Gaia will detect and very accurately measure the motion of each star in its orbit around the centre of the Galaxy. Much of this motion was imparted upon each star during its birth; studying this motion allows astronomers to peer back in time, to when the Galaxy was first forming. By constructing a detailed map of the stars, Gaia will provide a crucial tool to study the formation of our Galaxy, the Milky Way. While surveying the sky, Gaia is bound to make many other discoveries. During its anticipated lifetime of five years, Gaia will observe each of its one billion sources about 70 times, resulting in a record of the brightness and position of each source over time. Together with the unprecedented accuracy of the astrometric measurements, this will lead to the discovery of planets around other stars, asteroids in our Solar System, icy bodies in the outer Solar System, brown dwarfs, and far-distant supernovae and quasars. The list of Gaia's potential discoveries makes the mission unique in scope and scientific return. Huge databases of information will be compiled from the Gaia data, allowing astronomers to trawl the archives looking for similar celestial objects, or events and other correlations that might just provide the clue necessary to solve their particular, seemingly intractable, scientific puzzle. The Gaia spacecraft is composed of the payload module, the service module and the deployable sunshield. It had a launch mass of around 2 tonnes. The payload module is built around a toroidal-shaped optical bench (about 3 m in diameter) which provides the structural support for the single integrated instrument that performs three functions: astrometry, photometry and spectrometry. The payload module also contains all necessary electronics for managing the instrument operation and processing the raw data. The service module comprises all mechanical, structural and thermal elements supporting the instrument and the spacecraft electronics. It includes the micro-propulsion system, deployable sunshield, payload thermal tent, solar arrays, and harness. The service module offers support functions to the Gaia payload and spacecraft for pointing, electrical power control and distribution, central data management and radio communications with Earth. Gaia is placed in an orbit around the Sun, at the second Lagrange point L2, which is named after its discoverer, Joseph Louis Lagrange (1736-1813). For the Sun-Earth system, the L2 point lies at a distance of 1.5 million kilometres from the Earth in the anti-Sun direction and co-rotates with the Earth in it's 1-year orbit around the Sun. One of the principal advantages of an L2 orbit is that it offers uninterrupted eclipse-free observations. From L2 the entire celestial sphere can be observed during the course of one year. 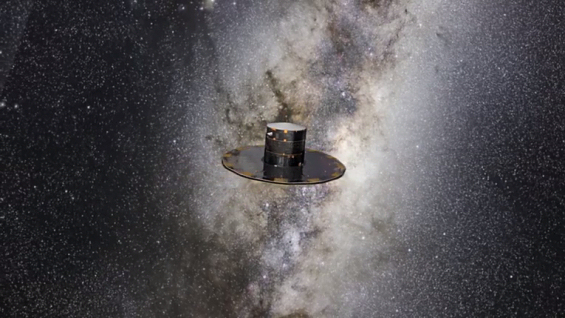 To ensure Gaia stays at L2, the spacecraft must perform small manoeuvres every month. Gaia is not the only ESA mission that favours L2. Herschel and Planck have operated from there and current plans call for JWST and Euclid to be placed there, too. Gaia is not the first space mission to chart the heavens. In 1989, ESA launched Hipparcos. Sounding like the name of Hipparchus, the Greek astronomer, its different spelling reflects that the name was also an acronym for HIgh Precision PARallax COllecting Satellite. This entirely European mission was the first satellite to chart the positions of stars. Hipparcos produced a primary catalogue of about 118 000 stars, and a secondary catalogue, called Tycho, of over 2 million stars whose positions were determined to slightly less precision. The data is now widely used by the entire community of professional astronomers. Among other results, Hipparcos' data contributed to the prediction of when comet Shoemaker-Levy 9 would collide with Jupiter. The data showed that many billions of years ago, the Galaxy swallowed a large group of stars. Hipparcos also helped astronomers to refine the age of the Universe. Gaia significantly improves on Hipparcos for a number of different reasons. For example, the collecting area of the primary mirrors means that Gaia collects more than 30 times the light of its predecessor, allowing for more sensitive and accurate measurements. Gaia measures a star's position and motion 200 times more accurately than Hipparcos. Changes in a star's position and motion are registered as tiny angles. As a comparison, if Hipparcos could measure the angle that corresponds to the height of an astronaut standing on the Moon, Gaia will be able to measure his thumbnail! On Gaia, highly efficient cameras known as CCDs are used to record the images, so wide-angle images of many celestial objects can be obtained at the same time. Devices known as photomultipliers were used on Hipparcos, which meant that the satellite could only record information from a single celestial object at a time. Astronomers have the challenge of dealing with a flood of data since Gaia began its work in 2013. Even after being compressed by software, the data produced by the five-year mission will eventually fill over 1.5 million CD ROMs. These data are transmitted 'raw' and need processing on Earth to turn them into a calibrated set of measurements that can be freely used by the astronomical community. So, ESA had not only to design and build the spacecraft itself, they also had to develop new computer software that will ensure the data can be processed efficiently once it is back on Earth.